It's BBQ weather, so out came the barbie and on went some kebabs. Normally when we have a barbecue, we have friends or family over. It's a bigger affair. 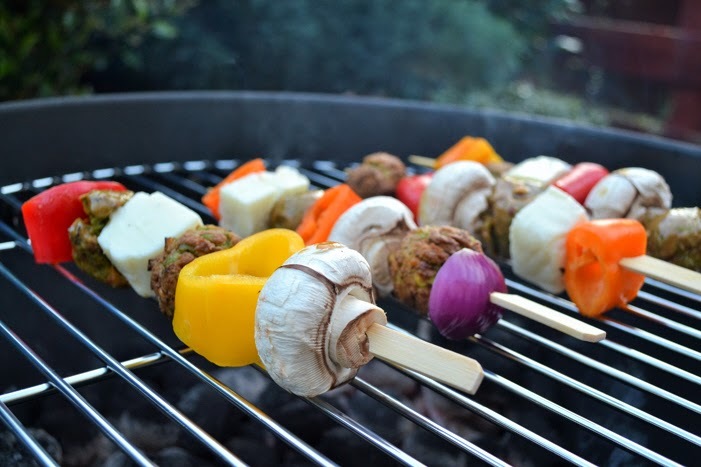 We barbecue veggie burgers and sausages as well as vegetable kebabs. There's lightly toasted rolls, mustard and relish all sitting waiting patiently along with some freshly prepared green salad, pasta salad and coleslaw. The beer, wine and soft drinks are chilled and for dessert we pop bananas on the grill still in their skins and when they're hot and soft we serve them with brown sugar and whipped cream. This wasn't that kind of a barbecue. Cooper was staying with his grandparents and there wasn't a guest in sight. It was a small affair, just myself and Graham wanting to try out our new toy. 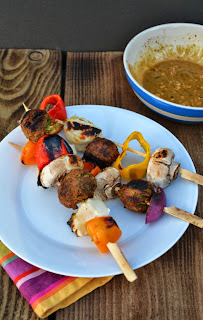 We kept it simple and just grilled kebabs. Boy oh boy did we struggle to get that coal burning. It took so long. It was just as well Cooper wasn't around, he would never have managed to wait so long for dinner. I decided to try something different this time and added flavoured falafel to our kebabs. I added Tuscan Bites and Mint Quinoa & Broad Bean Bites to pre-soaked skewers along with red onion, peppers, mushrooms and halloumi. The bites are falafel in style and come from a company called Great Food who do a fabulous selection of vegetarian products. The Tuscan Bites have butternut squash, spinach and carrots as a base and you can guess what's in the other ones. I've tried their Morrocan Falafel too and they're good, but I have to say the quinoa bites are my favourite. I munched on a few while we were waiting for those darn coals to heat. Adding falafel to kebabs was a great idea, although as you would expect we lost a few to the Gods of fire, but it was worth the sacrifice. I coated some in marinade and left some plain for variety. 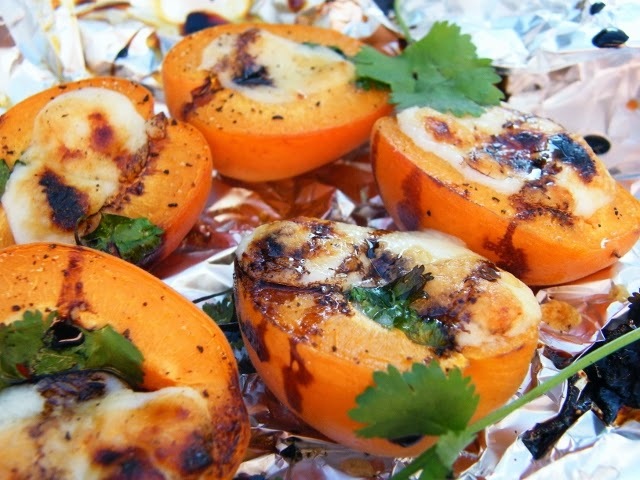 The marinade was a spicy nutty based one and would work well of burgers and sausages too, but if you're barbecuing falafel or bites, just coat them lightly. If you leave them in marinade they will become too soft to add to the skewers. While you're at it grill a few extra bites for midweek lunches, the smoky flavour will work really well nestled in wraps and pitta with salad. A nutty marinade spiced up with chilli and cumin. Perfect for perking up burgers and sausages grilled on a barbecue. 1. Mix all the ingredients in a bowl, cover and set aside until you are ready to marinade.2. Brush onto falafel or briefly roll the falafel in the marinade. Do not leave to soak as they will become too soft.3. Leftover marinade keep in the fridge for a few days or frozen until your next barbecue.4 Enjoy! Why not try these kebabs with this Kebab Shop Chilli Sauce from Fuss Free Flavour if you like a bit of a kick? Disclosure: I made this recipe for Great Foods. I was paid for my time and sent product to use in my recipe, but I was not expected to write a positive review and any opinions expressed are my own. I love peanut in savoury dishes - this looks great...never met a falafel I didn't like, either! Hope you enjoy it Luca and that the good weather holds. I love all the ingredients in this marinade. It sounds fantastic and is just the type of thing I love to make. Thanks Corina. I wasn't sure what type of marinade I was going to make until I spotted the peanut butter and though aha! The kebabs sound great, but the bbq experience is why I gave up! It always seemed to take so long to get going and by the time it had, the sun had gone away. Will look out for these bites. I know what you mean, i does take a while, although I think the coal we us were particularly bad. I don't remember having so such trouble getting them to burn before. Thank Nazima, I'm glad it inspired you. The bites were great on the kebabs, it's nice to have a good range of textures on them. We haven't been having much luck with lighting coals this summer. Sometimes it has taken forever. I wonder if there is a new formula, that they aren't lighting. Maybe a new European directive to do with safety lol! Yum that sauce sounds so addictive and I must look out for that range of veggie products, always great to have some standby goodies and these look yummy. Love a good BBQ! They are really good. 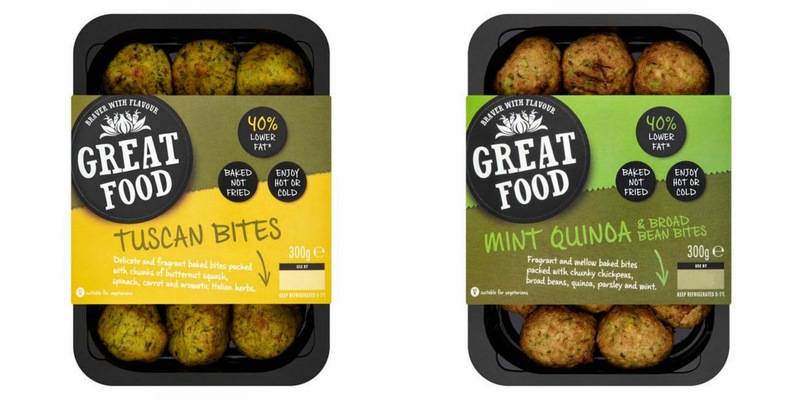 I've tried a few from the range and the mint quinoa ones are definitely my favourite. They are Janie, It gives them a nice smoky flavour. If I'd known you were lacking guests Jac, I'd have been over like a shot. It all sounds sooooooo delicious. The marinade sounds yummy, just wish we had outside space with our flat to have BBQs!